A driver who is required by law to yield the right of way must stop and yield. This is a necessary precondition for safety. Failure to yield the right of way can lead to an accident. #1: When you’re at a yield sign. #2: To someone who appears to be visually handicapped or has a guide dog. #3: To pedestrians at a crosswalk signal. #4: To other vehicles at uncontrolled intersections. #5: To vehicles on through roads at “T” intersections. #6: To oncoming cars, pedestrians and bikers when turning left. #7: To oncoming vehicles at the intersection between an unpaved road that you’re driving on and paved roads. #8: When returning to the roadway from a parking spot. What does the law: “Yield to the Driver on the Right” mean? 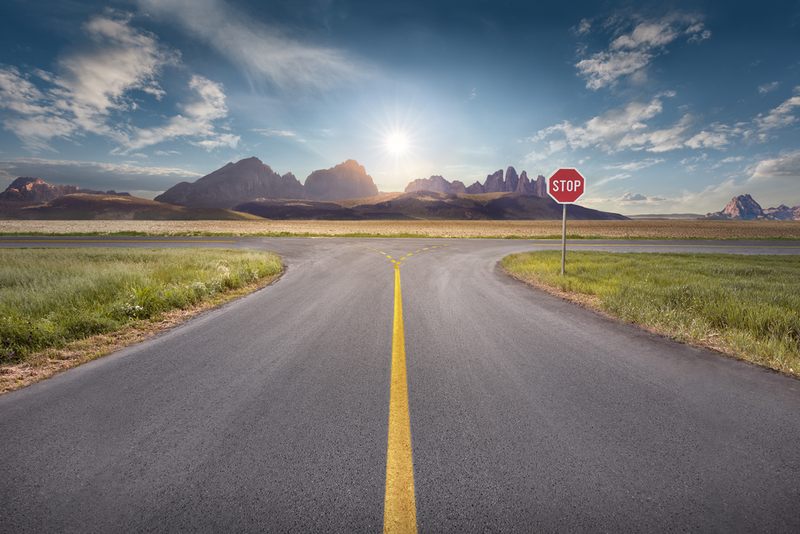 The most common right of way law is to “Yield to the Driver on the Right.” This is the law that governs who has the right of way when two drivers arrive at an intersection at the same time. Let’s say you’re at an uncontrolled intersection, one without a STOP or YIELD sign. You should slow down, yield to vehicles that are already in the intersection or just about to enter it right in front of you. Yield to the vehicle that arrives first. If you and the other car arrive at the same time at the intersection, you should yield if the car is on your right. However, this is based on common sense. If the other driver expects you to take your turn and signals you to do so, then go ahead and take it, instead of stopping or slowing down the traffic behind you. What if you’re at a 4 way stop? 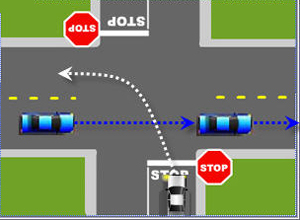 If two vehicles arrive at an intersection at the same time at a 4-way stop, then the vehicle on the left should yield the right of way to the vehicle on the right. 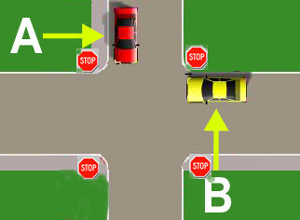 In the above graphic, the car B should yield to car A. What if there is no signal control for the cross traffic? In that case, you have to STOP until the cross traffic is gone. As you can see in the above graphic, the White car yields the right of way to the Blue car and makes the left turn only after it’s gone. For more information on the right of way laws, visit the DMV.org website.